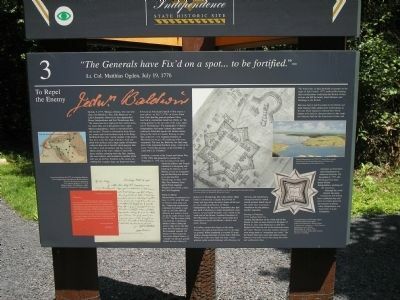 Baldwin, a veteran of the French and Indian War (1756 – 1763) and promoted to colonel on September 3, 1776, had assistance from other American officers and French volunteers in designing and building the defenses at the Mount, as well as strengthening and building new defenses at and near Fort Ticonderoga. In May 1777 Maj. Gen. Horatio Gates asked Polish engineer Thaddeus Kosciusko to help the Chief Engineer. In October construction began on the main defense, the eight-pointed picket fort on the highest ground. When completed it covered 4.5 acres with an outside perimeter of more than 1,600 feet. Within the walls were eight one-story, wood-planked, gable-roofed buildings with chimneys for barracks and storehouses, arranged around a central parade ground. Inside one of the points they excavated a foundation for the primary powder magazine. This is a three sided marker at a junction of a walking trail on Mount Independence. of the American states, Dr. James Thacher wrote that “utmost exertions” were made to “strengthen our works.” On the Mount three new stone and earthen cannon batteries were built in late June along the south and southeastern lines. The Americans, as they hurriedly evacuated on the night of July 5 and 6, 1777, realized that burning their fortifications would alert the British of their actions and left the nearly intact defenses and buildings to the British. Between July 6 and November 8, the British and their German allies added more fortifications to the site. Their engineers ordered three blockhouses to be built in close proximity to the southern batteries built by Americans in June, and had plans to build three more blockhouses in unknown locations. On November 8, 1777, the British garrison abandoned Mount Independence, torching all the structures. Although the wood burned, the many foundations left behind have weathered time and serve as witness posts for the moment in history when independence was being built on Lake Champlain. 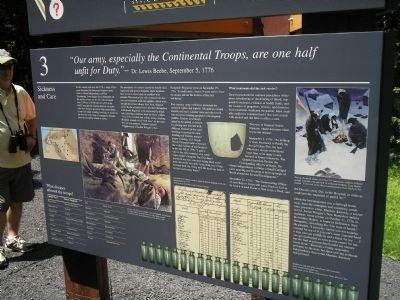 ranks at Mount Independence and Fort Ticonderoga. From August 24 to September 29, the number of men on the sick rolls increased from 1,878 out of 9,949 men to 4,072 of the 10,825 men present. Doctors did not yet understand how diseases spread or what caused them, so survival meant avoiding, resisting, or recuperating from the wide range of contagious diseases more than avoiding wounds in battle. What treatments did the sick receive? Doctors practiced the common procedures of the times: bloodletting or the drawing of blood, supposed to maintain a balance of bodily fluids, and the issuance of purgatives, emetics, and diuretics. Such treatments weakened the patient. Most available medicines contained herbs that were mixed with alcohol and did little to affect a cure. Often the best treatment was a furlough home away from the contagion and unsanitary conditions present in camp. Matthew Kennedy, a soldier in Col. Josiah Wingate’s New Hampshire militia regiment, wrote a letter on October 11, 1776, to his brother, Robert, at home in Goffstown, New Hampshire, describing his “low state of health.” He pleaded, “I earnestly intreat you not to delay coming for me or if you can’t come yourself Send a man you can confide in and a horse for me . . . I can get discharged as soon as one comes for me; but I am frail at present that I could not venture home alone.” Kennedy’s family responded promptly to the note, but upon arriving at Mount Independence discovered Matthew Kennedy had perished. What diseases affected the troops? Even before the American army straggled onto Mount Independence in July 1776, people had left their mark on the land here. For thousands of years Native Americans made tools out of chert, a black, fine-grained stone in numerous outcroppings on the Mount and traces of their industry may still be seen on the ground. Revolutionary War soldiers appear to have discovered and been fascinated by this ancient past; archaeologists have found projectile points in some of the soldier’s hut sites. On October 17, 1785, the Vermont legislature made note of the “Cannons, Mortars, Mortar Beds, Bombshells, Carriage Wheels of Cast Iron” in and around Mount Independence “which are public property, which are rendered unfit for service and may be of service in making bar iron.” They appointed Col. John Strong of Addison, Vermont, as a trustee to take charge of these items and sell at auction to the highest bidder. The buyer was iron monger Matthew Lyon of Fair Haven, Vermont. After the Revolution through to the mid-1900s, much of the land on Mount Independence was used to graze animals and was relatively undeveloped. Evidence of the Revolutionary past fascinated people over the years and the name of Mount Independence continued to appear on many maps. Amateur archaeologists excavated sites or collected on the surface at Mount Independence, adding to their collections but in the process disturbing or destroying evidence. The Vermont Board of Historic Sites purchased much of the southern half of Mount Independence in 1961, and began efforts to protect this important archaeological site and prevent “unauthorized and promiscuous diggings.” In 1965-66 they conducted the first survey and mapping work to document archaeological sites and lay out a trail system. Archaeologists conducted a small survey in 1975. 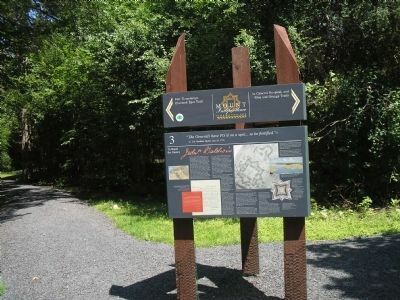 Major archaeological studies on the land occurred in 1989, 1990 and 1992, focusing on sites around the picket fort, general hospital, one American blockhouse, the Southern battery, a large storehouse complex, and two brigade encampments. An underwater survey in 1992 and 1993 focused on the 1777 Great Bridge and military supplies scattered on the lake bottom. Many of the artifacts and scholarly findings of these studies are on exhibit in the museum. Another survey in 2001 was conducted in preparation for the construction of the Southern Battery Spur of the Baldwin Trail. In 2003 results of all land archaeological studies were systematically mapped and verified. Today Mount Independence is considered one of the largest and best preserved archaeological sites of the American Revolution. Please help us keep it that way. Respect our history. Take only photographs. Location. 43° 49.495′ N, 73° 22.916′ W. Marker is in Orwell, Vermont, in Addison County. Marker can be reached from Mount Independence Road, on the right when traveling south. Touch for map. 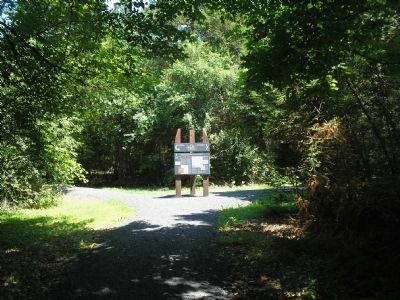 Marker is along the walking trail in Mount Independence State Historic Site. Marker is in this post office area: Orwell VT 05760, United States of America. Touch for directions. Other nearby markers. At least 8 other markers are within walking distance of this marker. General Hospital – 1777 (within shouting distance of this marker); Burial Site (about 500 feet away, measured in a direct line); Third Brigade Encampment – 1776 (about 600 feet away); Heritage Travelers over the Years (about 600 feet away); Storehouse - 1776 (about 800 feet away); Lake Champlain and the American Revolution (approx. 0.2 miles away); British Blockhouse - 1777 (approx. 0.2 miles away); Foundation -1776 or 1777 (approx. 0.2 miles away). Touch for a list and map of all markers in Orwell. More about this marker. On the first marker: The top right of the marker features a painting of Mount Independence in 1776-1777 from the Collection of the Mount Independence Coalition and Mount Independence State Historic Site. Next to this is an image from the powder horn of John Calfe showing the picket or star fort and citadel or horseshoe battery, from the Collection of the New Hampshire Historical Society. On the second marker: A picture of sick soldiers at Mount Independence is at the top of the marker. It has a caption of “During 1776 disease ran rampant, care was remedial, and hospitals were poor places in which to recover. Greg Harlin painter, Collection of the Mount Independence State Historic Site,” Another painting by Harlin is at the marker’s upper right corner, with the caption, “During the harsh winter of 1776-1777 American soldiers suffered greatly from the cold and lack of sufficient clothing.” Also on the marker is an “Itemized list of supplies used to equip the British hospital on Mount Independence in 1777, from the Collection of the Library and Archives Canada, and a picture of Stoneware cup and glass medicine vials excavated at the General Hospital Site, from the Collection of the Mount Independence State Historic Site. On the third marker: A photograph taken during the 1990 archaeological study of the General Hospital area appears on the right side of the marker. 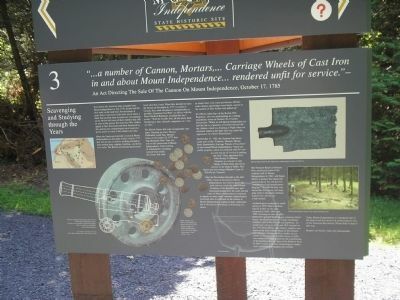 Photos of a shovel, a carriage wheel and various coins excavated on Mount Independence also appear on the marker. More. Search the internet for To Repel the Enemy. Credits. This page was last revised on June 16, 2016. This page originally submitted on May 30, 2009, by Bill Coughlin of North Arlington, New Jersey. This page has been viewed 1,569 times since then and 6 times this year. Photos: 1, 2, 3, 4, 5. submitted on May 30, 2009, by Bill Coughlin of North Arlington, New Jersey.